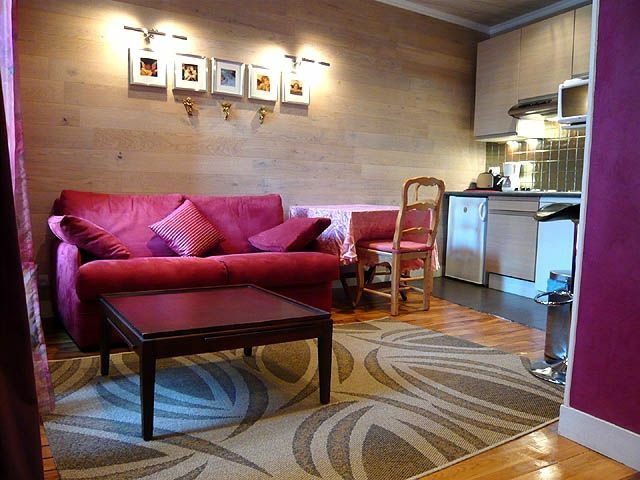 Totally LEGAL apt, with authorisation of short-term rental by CITY of PARIS. Rue du Bourg tibourg, one of the best street of le Marais, equally between metro HOTEL de VILLE and METRO Saint-Paul. All the restaurants and supermarket just at the bottom for a easy and comfortable stay. Totally renovated, this prestigious apartment completely equipped and furnished is located in the heart of le MARAIS, rue du Bourg-Tibourg, inside a courtyard, 2nd floor, with a private balcony. FREE WIFI furnished. FREE international phone included. Many testimonials from previous tenants upon inquiry. - Address : rue du Bourg-Tibourg 75004 Paris. - Located in an old typical parisian home built at the begin of the XXth century, 2ng floor without lift. - Surface : 30m2. A principal room with bed, table/chairs, computer. Kitchen. Bathroom. WC. - Private balcony outside with table + 2 chairs. - Bedroom with huge queen size bed. - Very clear and totally quiet with 2 huge door-windows. Through the window, view on the private yard. - Kitchen fully furnished, microwave, toaster, coffee machine, refrigerator, etc. - TV-DVD with 20 cable channels, english channels..
- FREE high speed connection included. - Hair Dryer - Iron. - Housecleaning with new linen/towels every 10 days included for a long-term rental (one month). 10 years of service and experience now. Several apartments furnished in le MARAIS and St GERMAIN des PRES. Available permanently to take care of tenants. 300 testimonials in my private guestbook upon request. Plasma TV, ADSL internet line free high speed and unlimited + computer, washer-dryer. FREE international call phone included. Everything was great.We spent 10 days there. Excellent location, good wifi, everything works well ( kitchen, bathroom, etc). Quiet apartment. And Thierry is very helpful and kind, we will come back ! Room is Awesome and eminities are superb. Very much accessible to metro. Only issue is it don't has elevator. You need to climb two stairs with your luggage. Thierry is very informative. Though he is not in city he explained everything on phone. Location is amazing, just a few blocks from Metro, Hôtel de Ville, Île de la cité. Lots of nice little restaurants on streets nearby, boulangerie on the corner and little grocery store right across street. Easy to find and access. wonderful host, very trustworthy and helpful, responding immediately to all communication. I look forward to staying here again. Merçi Thierry! Wonderful stay in a great neighborhood! Thierry was very helpful an answering questions during the booking process and kept in contact up until our arrival, giving us clear and helpful information. He greeted us at the apartment when we arrived, explained everything, and was always reachable throughout our stay to answer questions. The apartment had everything we needed, he even had a fan which we requested ahead of time. The bed was comfortable, bathroom was small but functional, and it was nice to have a clothes washer/dryer, dishwasher, and coffee maker. The balcony was nice although the view is into a courtyard, which made the room nice and quiet. The neighborhood had so many affordable restaurants, bars, and cute shops, and it was very central to all of the attractions and the metro. We loved the feeling of living like a Parisian with our own space to come home to after a long day of sight seeing. Would highly recommend this place to others. Fab location in Marais, easy walk to many cafes, restos, shops. Really enjoyed our stay - apartment very well appointed and clean. Easy and prompt communications with owner. Would not hesitate to stay again next time I'm in Paris. I have been to Paris several times and stayed in places facing the street. Although it's nice to look down on a street, it's hard to sleep. This apartment is on the 2nd floor (American) in the courtyard in the middle of the building with a nice outdoor patio you can sit and relax outside. So you don't get any street noise and there wasn't any noise from other residences in the building. Everything was neat and clean. We didn't cook but had breakfast items and tea in the morning. There is a washer/dryer but it doesn't totally dry your clothes (damp) . I may not have known how to use it properly but we just laid the close out to dry. I wasn't just happy we could wash in the apartment. The location is just where we wanted, in the middle of everything. And there is a supermarket right across the street which was very convenient. The metro stop is very close as well as the river. I will hopefully book this place again. Funny life, music, bars, night and day, right there!